Vikings Go to Hell is the latest chapter in Yggdrasil’s viking saga. The viking warriors are once again matching their skills against the supernatural and this time they’re battling it out with the devil himself. Join the furious vikings on their quest for pillage, mayhem and epic wins. You can try Vikings Go to Hell for free or play it with real money on all Yggdrasil casinos. With betting options ranging from 10 cents to $125 per spin, this pokie suits high rollers and budget players alike. There are 25 fixed paylines and the bet it adjusted by selecting the coin value per payline. Vikings Go to Hell has 5 reels and 4 rows of symbols. Vikings Go to Hell is packed with plenty of special features that keep the screen full of action. In addition to a steady stream of wilds, there are scatter symbols with free spins, treasure chests with random wins, re-spins and constantly filling rage meters for our viking heroes. Getting to the deepest levels of Hell will keep you entertained for a long time and you’ll have plenty of opportunities to bag some big wins on the way. Although most new slots look amazing, Yggdrasil has always done an excellent job with Vikings Go to Hell. The result is a visually stunning game that’s also fun to play. The graphics style is true to the two previous Yggdrasil viking pokies: Vikings Go Wild and Vikings Go Berzerk. However, from the intro video to the main game and special rounds, the look is more polished and fluid. The main winning symbols are the four viking warriors. They also have bows, axes, hammers and swords to keep the demons at bay. You can’t miss the wild and free spins symbols either, because they keep on appearing on the screen on regular basis. In Vikings Go to Hell online pokie, you won’t run out of special features any time soon. First, there are the four viking warriors with their rage meters on the left hand side of the screen. Any time you hit two free spins symbols, all the viking symbols on the screen will fight the demons. The winning vikings will turn into wilds and stay on the screen for a re-spin. Better yet, they also fill the rage meter of their respective viking. When one of the viking’s rage meters gets to 100 points, you unlock 7 free spins with that specific warrior in Berzerk Mode. A viking in Berzerk mode will always defeat demons, i.e. turn into a sticky wild until the end of free spins. You can also unlock the free spins by hitting three free spin symbols or looting them from a randomly appearing treasure chest. In Vikings Go to Hell, free spins are progressive. In each spin your vikings fight the demons for a chance to turn into a sticky wild. One of them also engages in a boss battle: if you destroy all the three health bars of the first boss, Lord of Chains, you’ll advance to the next free spin level. There you will be greeted by the final boss, Lucifir. Finally, there are the treasure chests. These land on the 5th reel on both the base game and free spins. In addition to the free spins, you have a chance to reap some hefty coin rewards and rage boosts in the base game. If you hit the treasure chests in free spin mode, be prepared to score some more spins, random wilds or an entire wild reel! Yggdrasil Gaming pokies are popular for a reason, so it’s understandable many casinos have taken them to their game selection. 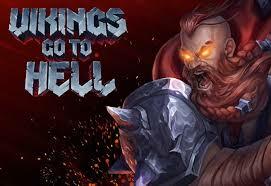 Try Vikings Go to Hell and the two previous viking games on best online pokie sites.